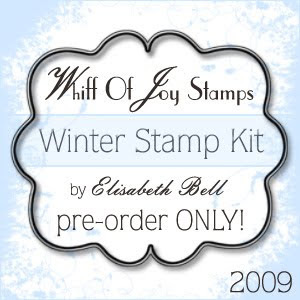 The pre-order for the Whiff of Joy /Elisabeth Bell Winter Stamp Kit opens today and closes on October 23rd. 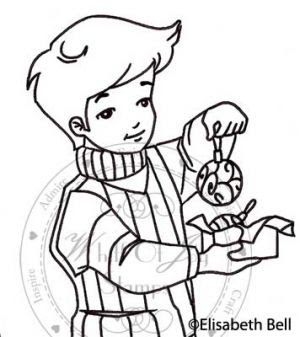 Elisabeth designed some extraordinary and charming christmas and winter stamps for our 4th stamp kit. Doesn't he just look too cute!! As a special surprise, Whiff of Joy is now also offering an exculsiv collection of metal charms, spacers, beadcaps and head pins. More to come soon! It's sketch week again this week, and Rach has done such an awesome sketch for us - loved working with it. Whiff of Joy challenges is one year old this week ... already!! We are going to have a bit of a "do" on Saturday so keep your eyes peeled for LOTS of candy!!! I loved this weeks sketch on Stamp with Fun so set to and got a card made last night (it was a mad rush as I also had to get my WOJ DT card ready for tonight (serves me right for swanning off to Ally Pally and meeting all those gorgeous girlies there last weekend lol). I kept telling them they were going to break their cameras by having my mug in the photo's but still got snapped (I so hate my photo being taken lol). Also got to spend some precious time with two of the nicest girlies on this planet - Jacqui and Rach. Right enough drivvel from me, here's me card. I used Henry with Wreath, these stamps are just sooo cute! I picked these papers up at Ally Pally on Sunday - was very good and hardly spent anything apart from the few bits and bobs I picked up from The Hobby House stand. I also attacked his Santa hat with Liquid Appliqué and Glamour Dust again. Another shot of the flower, umm yes I do love this effect lol. I'm sick of Christmas cards already and I have not even thought of mine yet rofl. Here's the last of the pink Xmas cards, this one was inspired by the uber talented Mina, her pleating is amazing!! No Liquid Applique this time, oh my goodness I need to go lie down in a dark room lol. 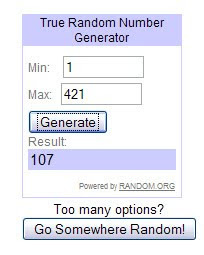 So without further ado, this weeks winner is a non-blogger for a change - Rene. I started this card for this weeks Create4Fun challenge (which is a fab sketch by Tiets) and got totally carried away and ended up doing a Gingerbread family - mammy gingerbread, daddy gingerbread and baby gingerbread, all Peachy Keen stamps. It's Saturday Surprise time again. This week Simon Says Stamp is going to supply a Magnolia Boat Tilda for this weeks candy. The challenge on Just Magnolia this week is a yummy colour combo, pink grey with black as an optional colour. So me being me, I went for all three colours. I am loving black for matting at the mo, it really seems to make the card pop. Good old tulle again, a few punched flowers with some roses layered on and some pearls and job done. It’s a Sarah Kay again, and not a piece of Bo Bunny paper in sight!! I went with the soft pretty pastel colours in these Kaiser papers for a non-traditional Christmas card. I attacked the step with my fave of the moment - Liquid Appliqué. Heidi from Simon Says Stamp sent me a tube of it and I LOVE it!! I sit here dreaming of Liquid Appliqué lol. How sad!! Firstly, thanks to everyone for bearing with me not visiting you for ages and ages - I have more or less done all the samples for the weekend - woohoo - so from tomorrow will be making some time to try and catch up with you all (think I'm going to be fighting a losing battle but will try my best to visit as many as possible). 6 Brads, 3 Papers and 2 Flowers. I started off my card by following last weeks sketch on Mojo Monday but got a little bit lost and landed up with something not quite to the sketch. (There's always one and it's usually me!!) I have used one of the Xmas Henry stamps from Whiff of Joy - each time a new release comes out I say they are my favourite, and this release sure is no exception. I just LOVE this little guy. What a pleasure to colour too. Alison, your artwork rocks hun!!! I have used MME papers - just love these, def need to stock up at the weekend to use on my Xmas cards (if I ever get any made, I can see me buying them this year ... blush blush!!). I used Liquid Applique on his hat (love this stuff for Xmas cards especially when sprinkled with Glamour Dust before heating to bubble it up). I just love this Santa, to me he's just what a Santa should look like - he sure has a twinkle in his eye and looks ever so jolly lol. I'm still scheduling the posts so will still be showing the sample cards for a good few days yet. If I don't there will be no cards to show. Getting there though, still have a fair few to make but hoping to get them all done before the weekend. I've used Bo Bunny papers again on this card - love the vintage look to them. 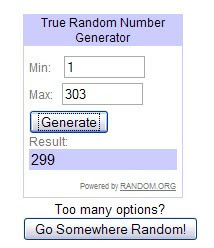 Congratulatioins sweetie, can you please email me with your address so I can get your prize off to you. I am waiting for one more item coming from the US to add to my Whiff of Joy Henry Mouse candy - it should hopefully be here by the end of the week. As soon as it arrives I'm good to go so will post the candy then. Me being Copics challenged (still - not had any time to practice with them) and all that was well gutted that I could not use the Pixie Chicks downloads from Charmed Cards but!!!! 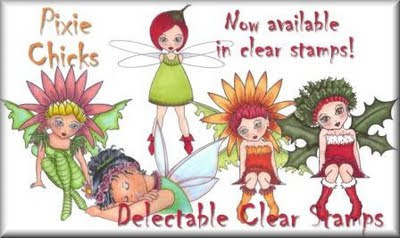 They are now available to buy as stamps woohoo. Guess who can't wait to get her mits on these little babies lol. I'm still scheduling posts well ahead of time whilst I get all the samples made for Ally Pally on the weekend. Here's one of the new Sarah Kay Christmas stamps, I have a few more cards made with these which will be posted in the next few days. I think the paper I used is a bit too busy for the stamp which is equally busy but it's stopping right where it is for now, no time left to redo it. I just love these Bo Bunny papers and was itching to use them, the rich burgundy colour is so perfect for Xmas cards I think. After lots of emails asking for puppy pics here's a few I snapped earlier. They are not that clear - as soon as the little tinkers hear or see me they're for the off, scattering all over the pen. They are now in their big pen (we call it the puppy condo lol) and loving all the extra space although yesterday they were absolutley petrified of the open space, flattened their bellies on the vet bed (stuck like glue more like it) and shivvered like good 'uns. Now, 24 hours later they are tearing about like nobody's business. Mammy’s little favourite. Betsy has wormed her way into my heart big time (putting it mildly – I’m head over heels in love with this little girlie). I had said after losing Toby so suddenly it was too soon to have another but ………..